Description: Treatment of tertiary alcohols with HCl leads to formation of tertiary alkyl chlorides. Notes: This proceeds through an SN1 mechanism. 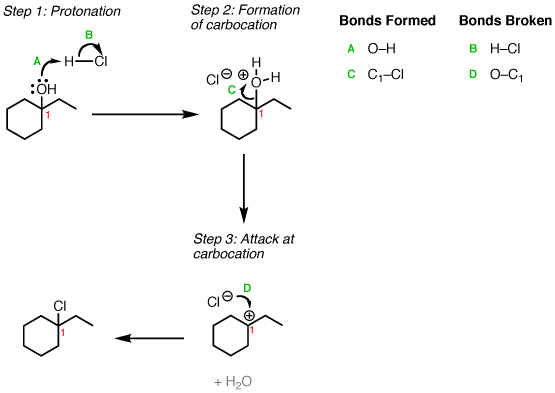 The reaction also works for other alcohols that form stable carbocations, such as allylic and benzylic alcohols. Notes: Note that in the third example, since a stereocenter is present, a mixture of stereoisomers (enantiomers) will be formed since the reaction proceeds through an SN1 reaction. Notes: If the alcohol were on a stereocenter we would obtain a mixture of stereoisomers. What are the benefits or importance of converting alcohols to alkyl chlorides? Great question! Alcohols don’t have a good leaving group, so they don’t undergo substitution or elimination (except under acidic conditions). However once you convert them to alkyl chlorides, you can then turn them into all kinds of other useful functional groups. For the third example, does chirality remain or change? You get a mixture of retention and inversion, which leads to a mixture of enantiomers. I updated the image to make it more clear. Thanks for asking. 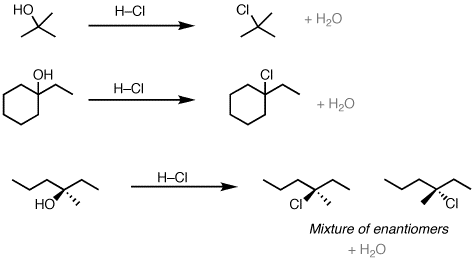 How to convert CH3-CHO to CH3-CHBr-CH3? In the third example, which product is favored? Although you get a mixture of enantiomers when a chiral carbon is attacked like in example 3 is there a slight preference for the inversion? Or do you get each at roughly 50 50?